I made it as a 2010 NaNoWriMo Winner! I did it! And I am so excited! My life’s work is dedicated to helping authors through the stages of getting their book, their “babies”, “masterpieces” aka manuscripts from finished manuscript as a raw Word Document through the design, layout, typesetting, and finally, to print-ready files, and this month I took a leap of faith to the other side of the fence. I wrote my first book. And as the Annual NaNoWriMo challenge requires, I had to write my book in 30 days and it had to be at least 50,000 words. I finished today at approximately 4:30 pm, ET and have officially been declared a “WINNER” and I am basking in that honor as I type this. My book is titled, “Apparently Sarah” and is in the Young Adult fiction readers category but would be great for ages 11 to 99+. I read a lot and lately much of it has been Young Adult Fiction – the books are easy reading, much of it we can all relate to in some fashion, and they’re often filled with life lessons that are not preachy. I am writing this post also to tip my hat to every author with whom I have had the pleasure of working with over the years — writing is a daunting process, particularly in the wee hours of the morning when you’re looking at a deadline and your brain or fingers just won’t co-operate! I have a great respect for you all! The next step will be to have my book thoroughly edited and then for me to decide if I want to publish it publicly to the open market or for now, just have it be my personal “winning story” for the 2010 NaNoWriMo challenge. Often long before I begin the actual process of designing a book and typesetting it, there is a process I go through with the author, editor and/or publisher, right through to the illustrators and printer. This process helps take the guesswork and headaches out of getting your manuscript to print. Good communication by all parties who will have a hand in putting the book together is a must. I begin by finding out who each is and making initial contact. Having a “Go-To” person is also a great idea so that emails don’t get lost or forgotten and changes and additions during the process make all those that need to know about them. 1. Initial contact with purchaser of my services, be it the author, Project director, or publisher. At this time, the “go-to person” or Project director should be established. 2. Contact information exchanged for all persons involved in the book project. Best to have both emails and phone numbers. 3. Establish scope of work. The page count of the book, trim size, types and number of graphics; who will do the cover design? 4. Proposed deadlines are established. When will the final manuscript be “final” and ready for the designer/typesetter; when will Sample Pages be presented for approval; when will first full proof be presented; what is the proposed to-Print deadline; and finally, what is the established Publication release date? 6. Present Sample Page Designs for approval. I usually present two page layouts of a sample chapter to show what I plan to use for text, headings, running headers, folios, front matter, page and/or part treatment, picture and caption placement, and all the elements that go into making your book the best it can be. 7. Design is approved for typesetting. This is a critical stage of the process. Once the design is approved, the book is then typeset from title page through final page. This involves text and paragraph formatting, insertion of headers, folios, TOC numbering, and often Chapter and/or Parts page elements and graphics, charts, and illustrations. Typesetting is a very skilled process and when done professionally is labor-intensive so that care is taken to watch for widows, orphans, bad line or page breaks, proper spacing, and formatting. 8. Full proof of book is submitted to client for review. A PDF proof is presented to the client for proofreading. This is not the time to rewrite the book. This is the stage where the client checks for any formatting errors or missed typos or grammatical errors from the manuscript that was submitted for typesetting. No matter how many eyes look at a manuscript, there are ALWAYS a few things missed that “jump off the page” once it is professionally typeset. The changes are submitted to the typesetter in a variety of ways: 1) Mark up the actual PDF document using Adobe Acrobat’s editing feature; 2) Print a hard copy of the PDF print, mark it up “the old fashioned way” using a red ink pen and proofer’s marks, or 3) Create a list in a word document with explicit instructions for the changes. 9. Revised proof is submitted to client for final review. If the book is approved and ready to go, we move on to step 10. If there are further changes or fixed, repeat steps 8 and 9 until the book is officially approved for print. 10. The final high resolution PDF file (Hi-Res) is prepared according to printer’s specifications and sent to the client. 11. Follow up with client and/or printer. You are not alone once you have the file in hand. I am here to work with you and your printer for any special needs or modifications that may arise. 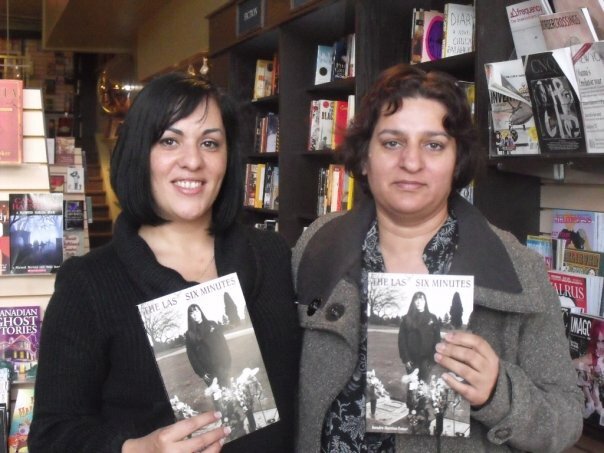 My job is to present your book in the best possible light for you and your intended audience. I have a deep and long-standing love of books and typography and believe a well-stocked book shelf is a beautiful sight! Happy Writing, Publishing, and Reading! 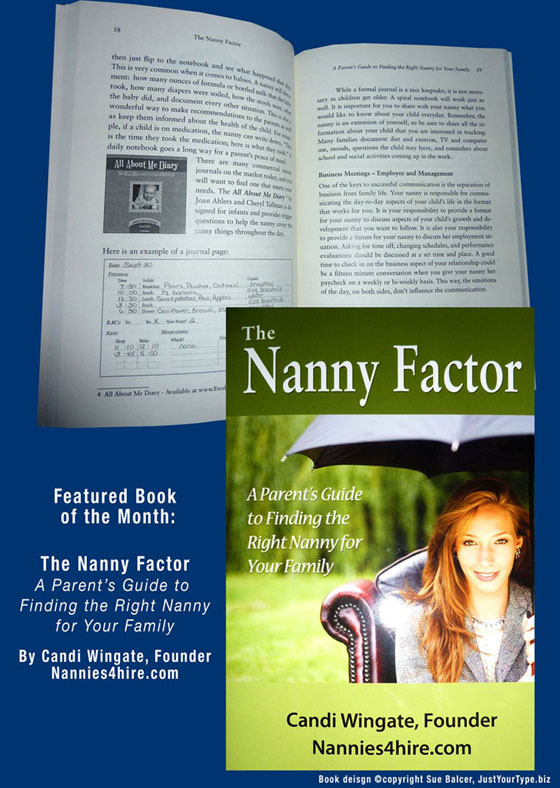 This month, I feature a book by Candi Wingate, Founder of Nannies4hire.com. 500 fastest growing private companies. The book is 6×9 and 150 pages, paperback. In this highly anticipated continuation to Sandra Martins-Toner’s first book “The Last Six Minutes,” the sequel “Cry for Justice” takes Sandra’s readers through the years of being dragged into the convoluted Canadian Criminal Justice System. Cover and interior page design by Sue Balcer of Just Your Type DTP. I am so happy to announce I have moved myself, my family, our cat my business to Squirrel HIll, Pennsylvania, just 6 miles east of Pittsburgh. It’s a beautiful old township with plenty of things to do within walking distance. Fricke and Schinley Parks are on either side of us and Carnegie Mellon is not far away. I am currently “en route” and will be setting back up shop on July 5, 2010 after unpacking and the holiday. Will post pics of our new surroundings once I am set up and have toured the area. Looking forward to working with all of you after my relocation! p.s. I will be posting the “Featured Book of the Month” as well – I have fallen behind on that. Only 1 Shot is a story about increasing one’s personal happiness; about reclaiming one’s life. In this book, you will learn how to develop a personal strategy for living thereby enabling personal alignment which is a prerequisite to maximize the personal, professional, and financial potential that life offers. Moreover, you will rediscover the joy of living. The book is filled with tables and illustrations to demonstrate human conditions, strategies and offers worksheets for personal growth. It is 726 pages at a 6″ x 9″ trim size. I thoroughly enjoyed working on this project with the author, Randall Rogers, and wish him great success with this book!